Top destinations for Turkish exports, totaling $13.2 billion in January, remained unchanged with Germany, the U.K., Italy, Iraq and Spain. Turkey's exports in January increased on a yearly basis, while imports went down, the Trade Ministry announced yesterday. According to the special trade system, the exports reached $13.2 billion in January, up nearly 6 percent compared to the same month last year. Calculated on the general trade system, the exports totaled $13.9 billion, up 6.3 percent year-on-year. "The Trade Ministry will reveal foreign trade figures based on both the special trade system and the general trade system throughout 2019," Ruhsar Pekcan said at a news conference in the capital Ankara. "Our imports in January based on the special trade system were $15.7 billion [down 27 percent on a yearly basis] and based on the general trade system were $16.2 billion [down $26.9 percent annually]," Pekcan said. The foreign trade gap in January narrowed over 70 percent to $2.5 billion based on the special trade system and to $2.3 billion on the basis of the general trade system. Pekcan added that the exports-to-imports coverage ratio based upon special trade systems advanced to 83.85 percent last month, up from 57.8 percent in January 2018. The figure was 85.7 percent based on the general trade system, she said. 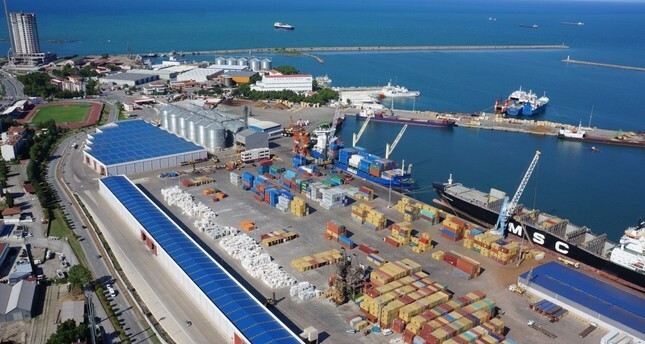 The chairman of the Turkish Exporters Assembly İsmail Gülle said the country set an export record in the month based on the special trade system. Stating that exports from free trade zones reached a considerable amount, Gülle said figures calculated on the basis of the general trade system will show Turkey's exports performance more inclusively. Gülle said that automotive industry continue to be the leading sector with exports worth $2.3 billion last month, followed by both chemical products, and ready-made garments and apparel with $1.4 billion. The highest exports increase in January was seen in the shipping and yacht sector with 116.2 percent. He said the most remarkable increase among industrial products was seen in ship and yacht sector exports which enjoyed a 116 percent rise, in the jewelry sector with 94 percent, and aerospace and defense with 64 percent. The manufacturing industry accounted for 80.7 percent of the total exports and rose by 7.6 percent compared to the same period of last year. The manufacturing exports totaled $10.6 billion last month. Agriculture exports decreased by 0.4 percent and dropped to $1.9 billion. The mining industry made up of 2.3 percent of aggregate exports, but fell by 22 percent and generated $305 million. The top export markets for Turkish products were Germany, the U.K., Italy, Iraq and Spain. The exports to Libya rose by 2.5 times and sale of Turkish products to Yemen doubled. Exports to Germany were recorded at $1.3 billion. The U.K. imported products worth $966 million from Turkish manufacturers. The value of exports to Italy stood at $818 million. Russia came first in Turkey's imports with $1.7 billion and was followed by China with $1.4 billion. Turkish lira was the medium of exchange in exports to 167 countries and a total of TL 4 billion was generated in trade with local currency. According to the Exports 2019 report, Turkey is very competitive in 47 out of 200 products most traded in the world. These 47 products include spare automobile parts, buses, construction material, refrigerators and garments.